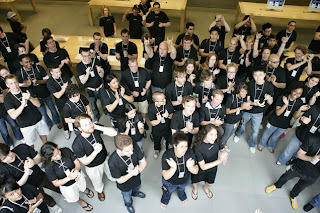 Terry Chan Photography: The Apple iPhone arrives today! Apple computers are definitely the master of hype. I should learn a thing or two and apply to my own business marketing strategy. Steve Job introduced the iPhone back in January. The Keynote address blew Bill Gate's keynote at the CES away. It was no coincidence that the 2 Keynotes were presented at the same time at 2 different cities... Las Vegas, and San Francisco. Steve Job's presentation was so smooth that he got everyone convinced that everyone needs an iPhone and all 5,000 attendees wants to haul out and get the damn thing right away! 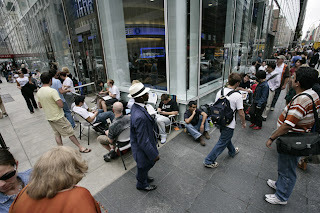 They had people lining up in front of the NYC 5th Avenue store starting this past Monday June 25th. They then closed the store from 2-6PM today to prepare for the launch. The people got anzy right around 6PM and the crowd started the chant in counting down to 6PM. 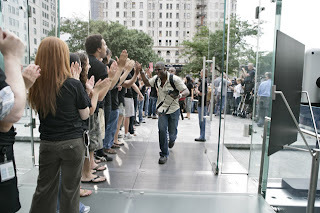 The press were swarming outside the store as well to catch a glimpse of the launching of the iPhone. 6PM rolls around and the guests who lined up were greeted with High-Fives and applause. These people just spent $1300 for 2 phones (because each person is allow to buy no more than 2 phones, and these people were running out of the store smiling. That's amazing! 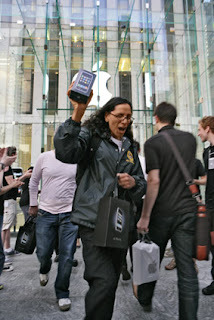 $1300 for 2 mobile phones and they were estactic and thought they were the luckiest people in the world!